Life is change. Changes forces us into the light or the dark. Dusk is the time in between. It defends the light from the dark. It’s the tipping point. Where things go well. Or where thy go very, very bad. Confront change. But you must first survive dusk. As a lifelong night owl, night time is my favorite time—it’s when I’m most alert, happiest, and when I function the best. The best part of nighttime is dusk, when I can watch the world slowly begin to quiet around me as the sun dips below the horizon, the air chills, and everything takes on this hushed tone of mystery, curiosity, and adventure—or, as we see in this collection, maybe something a little more sinister, a little tougher to understand. 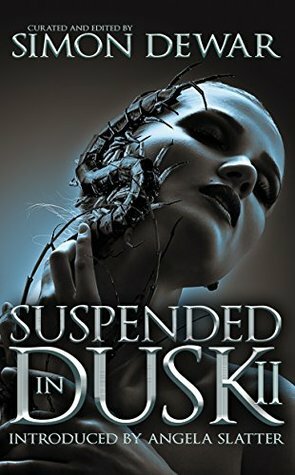 Suspended in Dusk II is a horror collection of stories that all somehow involve this odd, captivating time of day—whether it’s through symbolism or fact, mysticism gone wrong or one’s impending demise approaching as the light fades. It’s a delightfully enjoyable collection, full of authors I recognized and loved as well as names altogether new to me, and I can absolutely recommend it to any fans of horror, but especially anyone looking for new indie horror authors to support. Something else I have to gush about here is the fact that, right in the foreword of the anthology, it’s mentioned that the collection of authors involved is very diverse—authors here range from multiple gender identities, sexualities, races, religions, and backgrounds. Given that horror literature is viewed by so many as a white man’s sport, it’s always refreshing to put the spotlight on women and marginalized individuals in the community, and I appreciate Dewar’s efforts on that front tremendously! → THE SUNDOWNERS by Damien Angelica Walters, in which an elderly woman is convinced that people have taken her husband from her and are plotting against her. → RIPTIDE by Dan Rabarts, a story full of Maori lore and the tragedy that has befallen a man seeking his lost children. → DEALING IN SHADOWS by Annie Neugebauer, where we watch a woman mourning her father’s death consider striking a deal with Shadow People to get one last moment with him. → WANTS AND NEEDS by Paul Michael Anderson, a devastating story of a woman left to face a blizzard on her own after the death of her son and the end of her marriage. → LOVE IS A CAVITY I CAN’T STOP TOUCHING by Stephen Graham Jones, which revisits the memories of a man who, as a teen, shared a bonding moment with his girlfriend that involved consuming bits of one another’s flesh, and the ways that moment has shaped the rest of his life. While these four were the stand-out titles to me, I gave almost every story in this collection 3-5 stars, and even the ones that didn’t work out as well for me were due to personal taste and not a lack of talent in any shape or form. All in all, Suspended in Dusk II is a skillfully crafted collection of spooky tales. Thank you so much to the editor for providing me with this review copy in exchange for an honest review!